Bulky electronics cluttering your living room? Cable box, stereo amplifier, CD, DVD and Blu Ray Players a dominant part of your home décor? 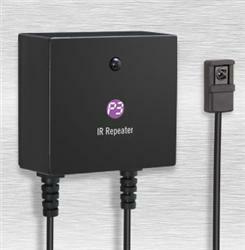 Now they don’t have to be with P3’s IR Repeater! 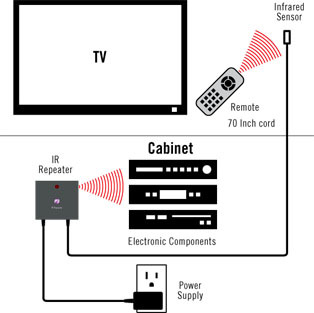 This easy-to-use home theater accessory utilizes built-in IR distribution technology to give you the ability to keep your electronic equipment hidden while still controlling them with your existing remotes. How it works: the IR receiver takes in IR signals from your remote and distributes those signals to your electronics. You’ll never have to leave your cabinet doors open, giving you a clean, seamless finish while enjoying all your entertainment center has to offer without leaving your favorite chair! Features a wall-mountable IR sensor and easy setup - no drilling or rewiring required.